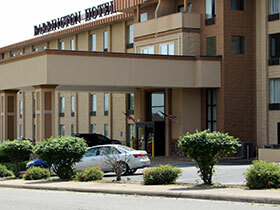 “Barrington Hotel & Suites” lets you enjoy the rare luxury of a peaceful location that’s still close to all the excitement for which lodging in Branson, MO is world famous! This beautiful property is near one of Branson’s grandest theaters, Sight and Sound, as well as shopping, attractions, and a host of other Branson theaters. The luxury is apparent as soon as you enter the lobby where you’ll find a gorgeous stone fireplace and hardwood floors. Featuring 145 rooms filled with luxurious amenities and incredible comfort, the “Barrington Hotel” more than lives up to its grand name! With well-appointed spacious rooms and suites, a substantial complimentary breakfast, indoor pool, and much more, you might find it difficult to leave! Feeling especially grand? Stay in the presidential suite that comes complete with marble jetted tub, a spacious closet, a granite countertop wet bar, a nice walk-out balcony, and more! Make your lodging in Branson, MO convenient, quiet, hospitable, and elegant...make the “Barrington Hotel & Suites” your home away from home!